The start of “brewing season” is almost upon us. Brewing season is that time of year when temperatures fall low enough to allow most homebrewers to ferment ales with little or no active temperature control. James and I have got a bit of a jump on brewing season with some recent brewdays. 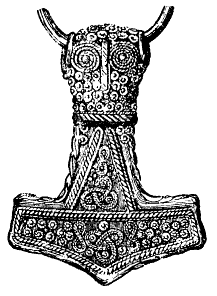 Here’s what we are working on right now. What are you brewing? Here are 5 tips for a better big beer fermentation, for certain values of 5. Fall is almost here and now is the time to start brewing your big beers to have them ready for the cold nights this winter. One of the biggest keys to brewing a good strong beer is to conduct a healthy fermentation. 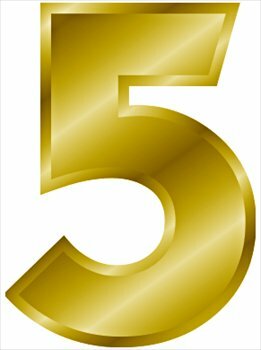 Today I’ll post the top 5 keys to doing that, and tomorrow I’ll post the next 5. 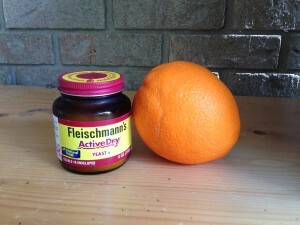 Pitching enough yeast will result in your fermentation getting a good, quick start. A fast start to fermentation limits the potential for contaminants to get a foothold in your beer. In a big beer, that may be aged extensively, this is a big benefit. Consult a yeast pitching rate calculator to determine how much yeast to pitch. 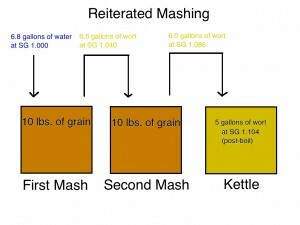 A diagram of how reiterated mashing can work at home. The basic idea is to use wort as your brewing liquor for a high-gravity batch of beer. 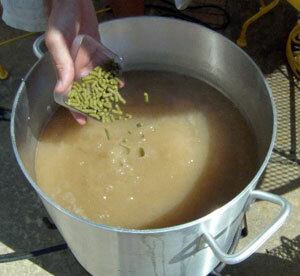 So, you mash once to make your brewing “water” and again with wort to make your high-gravity wort. 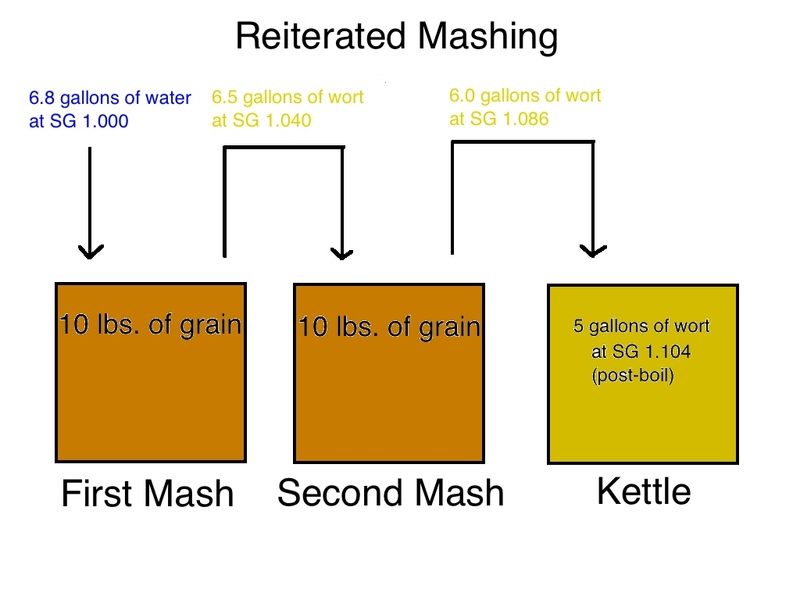 One way to look at reiterated mashing, and to understand when you might want to use it, is to compare how it concentrates the wort compared to other, standard ways of brewing. 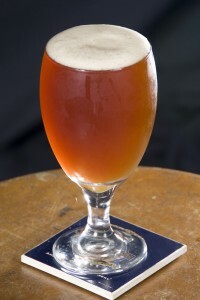 To brew a big beer normally, you would collect a lot of wort and boil it for a long time. 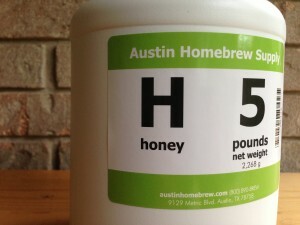 You would end up with a high-gravity wort because you boiled off lots of water. Another way to make a big beer is to add malt extract. In this case, the manufacturer of the malt extract would have boiled off (and otherwise evaporated) lots of water for you. In reiterated mashing, you don’t concentrate the wort in the kettle by applying heat and evaporating water; you concentrate the wort via simple diffusion in the mash tun. Because of this, you get much less color in the wort. You could brew a dark colored beer this way, but the other, “regular” ways of making a big beer would be faster. 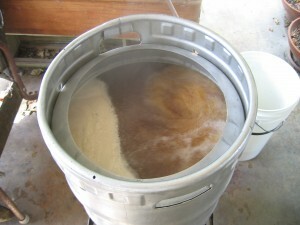 Reiterated mashing is best used for making a very high-gravity beer with very little color.